A play by David Mamet, performed at the Donmar Warehouse, London: 16 March (previews began 8 March) - 14 April 2001; transferred to the New Ambassadors Theatre (now known as the Ambassadors Theatre), London: 3 December (previews began 28 November) 2001 - 16 February 2002. Set in late nineteenth-century New England, David Mamet's darkly comic play focuses on the intimate relationship between two society ladies (a 'Boston marriage', as the union was termed during the period). Having ensnared a wealthy male protector, Anna is surrounded by luxury and believes the time is right to be reunited with her partner, Claire. When Claire shares unexpected news about her own personal affairs, the feathers begin to fly. The musings of Anna's maid, Catherine, provide light relief. One of the factors that draws Zoë to David Mamet's work is, she says, the 'sense of surprise' in his writing. Boston Marriage produces a degree of 'intrigue that resembles Victorian melodrama' (see 'Hogwarts and All' interview). Although David Mamet was not present at rehearsals, his influence could still be felt by the cast. 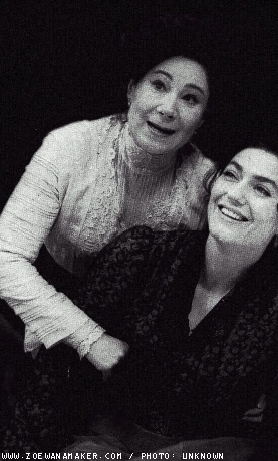 As Zoë and her co-star, Anna Chancellor, revealed, this led to them affectionately referring to the playwright as 'God', then 'Daddy' (see 'A Flurry of Fairy Lights' interview). Zoe was nominated for the 2002 Best Actress Olivier Award for her work on this production. As part of the Olivier Awards ceremony, she and Anna Chancellor spoke briefly about Boston Marriage, particularly the significance of the play's title. They discussed the production in more detail on tea-time talk show Richard and Judy. 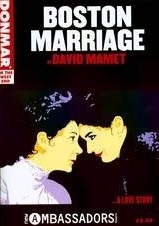 Boston Marriage is the second David Mamet play in which Zoe has acted (the first was The Old Neighborhood in 1998). 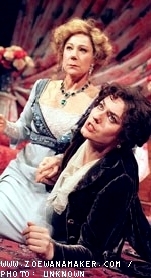 It is also the second play in which she has performed as part of an all-female cast of three, following Mrs Klein (1988). 'Zoe Wanamaker is brilliant as Anna', declared Michael Billington in the Guardian. With Boston Marriage's witty verbal sparring, she 'is superbly in her element', agreed CurtainUp.com's Lizzie Loveridge. Playwright David Mamet 'is well served by his cast, especially the wonderful Miss Wanamaker', concluded The British Theatre Guide's Philip Fisher. The play is 'a thoroughly delightful comedy of manners, of which Oscar Wilde himself might be envious', enthused Gerald Berkowitz in TheatreguideLondon. The Stage's John Thaxter was similarly impressed by this 'brilliantly acted, deliciously entertaining diversion'.